In the run-up to the nationwide Dia de las Personas Sin Hogar (Homeless Persons’ Day) on Sunday 25th November, four Spanish non-governmental organizations working with the homeless have launched a campaign to literally raise the visibility of homeless people — bringing their plight to the attention of others who pass them by on the streets everyday as though they do not exist. Under the slogan, “And what do you say? Enough! Nobody without a home!”, the effort hopes to raise public awareness about the violation of the rights of homeless people, their inability to access affordable housing and their virtual invisibility while enduring the constant insecurity and violence that comes with living on streets of cities and towns across Spain. Sponsored by Cáritas Española, the Federation of Associations and Help Centers for Marginalized Persons (FACIAM), the Platform Against Residential Exclusion and In Favor of the Homeless (besteBI) and Barcelona-based Network for Attention to the Homeless (XaPSLL), the campaign’s organizers say they’re trying to get Spaniards to recognize the level of suffering to which an estimated 40,000 homeless individuals are subjected, but that is ignored by most people going about their daily business on Spanish streets. The groups say Spanish society as a whole needs to recognize that “access to adequate housing is not a privilege, but a basic human right”. Citizens need to pressure government officials at all levels to work toward ending homelessness, they say, by enacting policies that guarantee homeless individuals the right to affordable housing and access to basic public services. 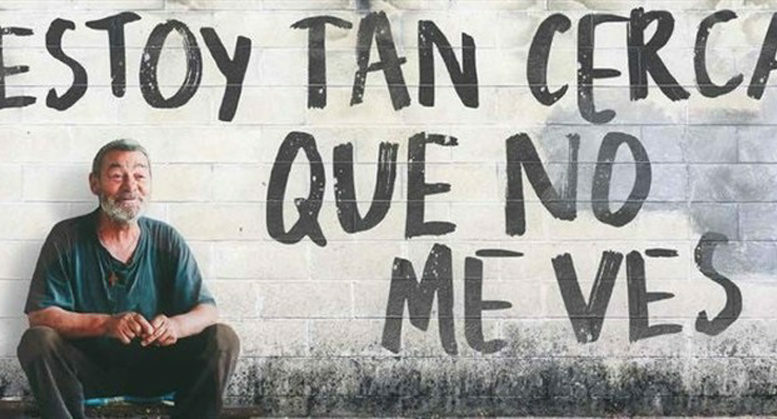 Campaign organizers also note that any lasting solution to the problem must begin to address the existing link between evictions and homelessness in Spain. On average during 2017, they say, 100 evictions for non-payment of mortgages were carried out every day across Spain, with four families ejected from their homes onto the street every hour.